I knew the memorial service was taking place at MacDonald Island Park, but I had decided to not attend. The decision was based on a couple of factors, really - my uncertainty as to whether I could handle the emotional impact of the event, and the life of the Intrepid Junior Blogger. The memorial, you see, was for the little boy who I wrote about recently, gone far too soon from this world. His loss touched thousands in this community, and so they came together to memorialize him in a field house at MacDonald Island, the only place large enough to hold all those who had been touched by his life. He touched my life too, this boy I had never met, this one who was his mother's shooting star, flashing across the sky. His life, all too brief, reminded me of the precious and fragile nature of our existence, and how we must treasure every single moment of it. I was considering attending the memorial, and then the IJB asked if I could take her somewhere on Saturday. The IJB is thirteen, and recently she mentioned a boy in her school. He had apparently asked her to the school dance but she had to decline, and instead asked if he could go rock climbing at MacDonald Island today. He said yes, and she informed me we needed to pick him up around 1 pm - the same time as the memorial. I hesitated, because I felt compelled to attend the memorial service too, but then I looked into those big brown eyes and I said yes, of course, we could pick him up then. I would do anything for those brown eyes, you see. And so we did pick him up, arriving at Mac Island to find the parking lot packed with cars - because so many were there to attend a memorial for little Will, the shooting star who has touched us all. I paid for their rock climbing, and we walked past the field house, where a photo of Will was displayed on a screen. I could feel tears welling in my eyes, but I steadfastly walked past and to the rock climbing wall where the IJB and her boy-friend (yes, note the hyphen - he is a boy, and he is her friend, and that's as far as I'm willing to discuss this aspect right now!) got their climbing shoes and tackled the wall. They climbed and as they did I wrote, working on some pieces, but my mind was distracted, never far from that memorial service and the impact it would have on all who attended, and even those who did not. When they finished climbing they found me. They were smiling and laughing, and smiled even wider when I suggested a stop at Yogen Früz. We wandered into the hall and towards the frozen yogurt, which is when I spotted the mom of the little boy we lost so tragically. I have not met her, but I knew I needed to say a few words to her, so I sent the kids into the yogurt line-up, and stopped in front of her. I won't share what we said, but hugs were exchanged. I will acknowledge that I cried freely, as I could not even begin to control that. When we parted I went back to the kids, and got my own frozen yogurt. We paid and then we sat together, talking. The IJB had gotten gummy bears on hers, and I was astonished to learn that neither of them, the IJB or her new boy-friend, had ever heard of biting the heads off gummy bears and sticking them to things, so I demonstrated the technique. We were laughing and chatting, and I decided to go make a phone call and leave them alone for a bit, too. When I was returning to the table to suggest we head home I ran into someone I know well, someone I have interviewed, and someone who lost her adult son in an accident on Highway 63 just over a year ago. When I saw her I felt the tears again, and I held her for a long time, because she had attended the memorial service. I saw the grief of loss so fresh in her eyes again, and her pain was so very real I could almost touch it. I held her and we talked, and she showed me a fresh tattoo, the words "Live life to the fullest" inked on her arm - in her son's handwriting. When we parted I walked back to the table in tears. The IJB informed me that her new boy-friend was buying some yogurt - and a whole lot of gummy bears. I put down my bag and whispered into her ear "I am going to hug you right now, because I need to", and so I did, right in that main concourse, with tears in my eyes. When the new boy-friend returned (a very nice young man, incidentally, and one who has my full approval in the life of the IJB) he had a cup with a tiny bit of frozen yogurt - and a lot of gummy bears. I saw the twinkle in his eyes, and the fire in the eyes of the IJB. I knew what they were thinking, and I knew this was the time I should probably be "the responsible adult" and forbid them from doing what they were about to do. And then I thought "live life to the fullest". And so we left Mac Island, with me leading the way and being very studiously oblivious to the children who were quietly gummy-bear bombing vending machines and signs. There are those who will think this was the wrong thing to do, to allow them to behave in such a fashion and to them I can only say this: life is too short to never break the rules. If a few gummy bears stuck here and there harm no one, and provide hours of laughter to two young adults, then I am quite okay with it. On a day when I felt so close to tears since dawn I needed to see that joy and laughter - and life. I needed to see that energy and enthusiasm and tiny little bit of naughtiness. On a day so filled with sorrow and pain, with grief and loss, I knew that what was needed was some laughter and fun and zaniness and mayhem - and so I accept responsibility for those stuck-on gummy bears. 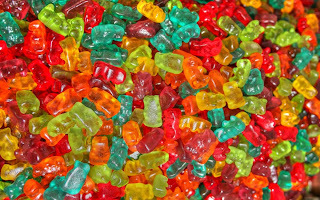 Somehow, in some crazy way, those gummy bears lessened my grief, and reminded me once again of the precious nature of this life. Somehow those gummy bears, and the faces of the IJB and her new boy-friend, helped to wash away the pain of the day, and dry the tears in my eyes. Because you see the thing about grief is that it reminds us to celebrate life, too. Today this community celebrated life by remembering a little boy named Will who will never be forgotten. And tonight all over Mac Island there are little gummy bear reminders of life, and laughter, and joy. Celebrate life, people. 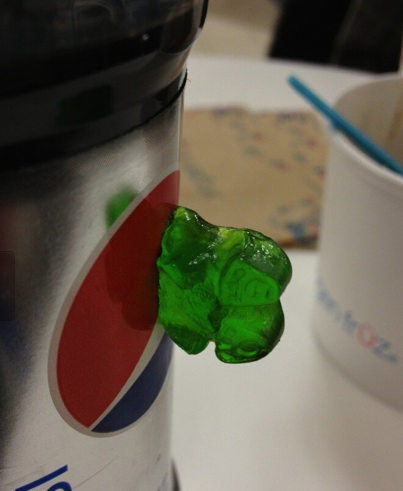 Live, love, laugh, and, if necessary, stick gummy bears to random things. Just get out there, and live - because life is far too precious and fragile and uncertain to do anything other than live it to the fullest.